So I had this crazy idea the other day to make some kind of dessert/sweet hummus. 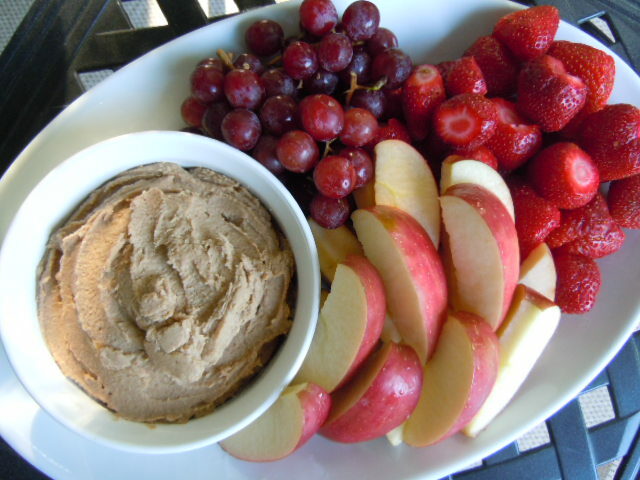 I Googled dessert hummus and found out that it wasn’t so crazy and in fact many other like minded people had already figured out how to do just what I was thinking of. Thank you Google. I wasted no time in whipping up this recipe and taste testing it – the things I do for the blog! It was love at first bite. If you like the flavor of Snickerdoodle cookies – sugar and cinnamon – you will surely enjoy this slightly sweet hummus! The high powered Blendtec or a Vitamix blender makes this super smooth and creamy. If you don’t have a high powered blender – no worries- you can also blend this in your food processor. You would never know the base ingredient was garbanzo beans. Trust me on this one and give it a try.